Charge and sync your iPhone 5 or iPod touch (5th generation) with the compact and stylish Belkin Charge and Sync Dock. 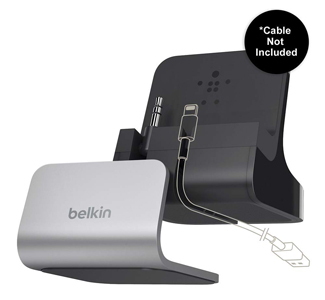 The Belkin Charge + Sync Dock with Audio Port has been designed to use the cable that came with your iPhone5 or iPod touch (5th generation), as this product does not come with a Lightning cable. We developed the Charge + Sync Dock for people who use their Apple supplied Lightning cable in multiple locations. The dock is intentionally designed for easy cable removal, so you can use it in other places like your Mac or in your car. For this reason, your Lightning to USB cable may come loose when you remove your iPhone. Docking your iPhone with the AUX jack in the upright position will help increase stability. To use, first remove the magnetically attached base from the dock. Then, take the Lightning cable that came with your iPhone 5 or iPod touch (5th generation) and feed it through the cable channel. Replace the magnetically attached base and you are ready to dock. If you want to listen to music while your iPhone is docked, connect your headphones to the audio port on the back, or connect to your stereo system with an AUX cable (AUX cable not included). 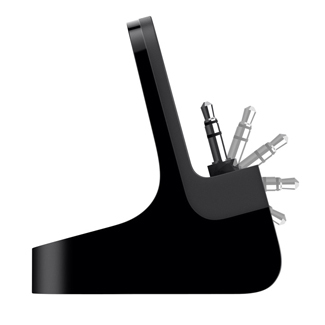 The Audio jack folds down back into the base if you just want to Charge and Sync. The Belkin Charge + Sync Dock uses your existing the Lightning connector by Apple, so you can charge and sync your iPhone 5 or iPod touch (5th generation) at lightning-fast speeds. The dock's removable magnetic base contains a cable channel that holds your connector securely in place for easy cable management. The Charge + Sync Dock makes it easy to enjoy music or movies while charging your device. Simply dock your device with the AUX jack in the upright position and plug your headphones into the audio port on the back of the dock. You can also listen using your device's speakers by folding down the AUX jack. And because the dock is compatible with most iPhone 5 and iPod touch (5th generation) cases, you don't have to remove your case before charging.